The bartender rushed back to me and announced, "Yes, we have one. Here!" My eyes widened with disbelief and I howled in delight over the booming of the disco's beat. My friend Dave from England next to me started smiling and shaking his head. He couldn't believe it either. Even the bartender was in shock, she confided it was the first she had ever seen. We had been looking for this exotic artifact for over 2 weeks now, our 6-man English party crew had gone through at least 300 bottles of Red Horse together. She handed it to us, we gingerly looked it over carefully, religiously, like it was the golden idol in Raiders of the Lost Ark. It was indeed a Happy Horse. And I was finally granted the power of its luck that night. It all started rather innocently, Frendz Resort was the best-rated hostel on White Beach, and all the internet savvy and deal-hungry budget travelers found their way here eventually. Thus, I was finally back in that happy backpacker coven you find so easily in places like Western Europe, Oz, and Thailand. I was surrounded by hilariously witty English, cute Norweigen girls, Swedes, Swiss, Germans, Canadians, Aussies, and the rare American. Over the requisite card games the backpackers told their funny travel stories and bonded in preparation for a Big Night Out. One of the English guys who would become our guide, Dave, told us casually of the Legend of the Happy Horse. Supposedly in every crate of Red Horse there was one bottle that was twice the alcohol and had perhaps some other illicit ingredients. The solemn Red Horse was replaced by a giggling one. But if that was so, someone was hiding these supposed Happy Horses, for we asked night after night, and bartenders dutifully looked and then always came up saying "Sorry Sir". I decided it was Santa Claus, a good story to market a product that didn't really exist. White Beach is a strange place. Its blindingly beautiful and insanely touristy at the same time. An hour long massage on the beach was an incredibly cheap US$7, but a beach-front room at the Red Coconut could cost over $100. You could pay whatever you wanted to spend. My kiteboarding days were done, my knee had swollen into a grapefruit with my stupid antics on the windy side of the island. So each day was spent haggling for a cheap boat trip around the island or looking for a low-priced authentic Flipino restaurant, lazily reading, swimming in the clear water, trying to avoid getting burned into a red lobster. But it was really all just a way to kill time until the evening Olympics started. Please listen closely for today's beach party itinerary. Roll call will begin promptly at sometime around 2 in the afternoon. Maybe. This will be followed by the daily pledge of never drinking again, quickly followed by a cold San Miguel Pale Pilsen. Next, Nemo will explain to poor Rafi why noone was awake in time for the private boat hire. Again. But we Promise to be there tomorrow. The afternoon activities will consist of a 2 hour hot stone massage, swimming in the crystal clear water, and poor attempts at book reading. Sunset 2:1 happy hour cocktails begin at 5pm sharp at Cafe del Mar. The evening meal today is coconut shrimp salad with fresh mango... Tonight the world famous Mint band will perform at ... The Mint. Drinking games at the hostel will commence at 10pm, followed at midnight by Ted the Dance Machine starting a break dance circle at Club Epic. Rain will start at 1am, dancing in the rain is strongly encouraged. The hunt for the Happy Horse will begin at 3am, hooking up and snogging at 4. Skinny dipping and sunrise watching on Bolabog Beach is set to begin at 7am. Good luck team and may the mango gods bless you with their fruit. 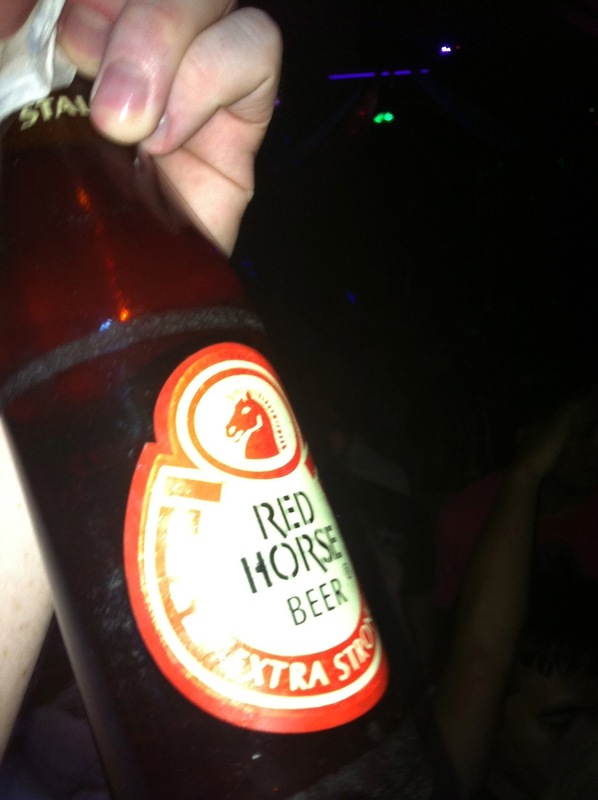 As we danced at Club Paraw at 5am, I held the Happy Horse high overhead, it was the Island's Totem. Another night in Boracay turned to dawn.